A neat specimen of Microcline, variety Amazonite, with a dusting of Schorl crystals. This locality is obviously best known for its attractive Topaz crystals, which are some of the best from the United States, but this classic granitic pegmatite has also produced some attractive turquoise-blue Amazonite specimens. 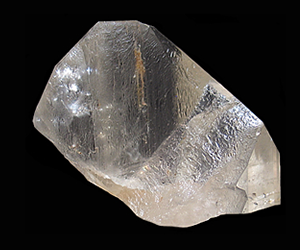 The termination of the crystal is white and has been etched resulting in a crenellated appearance. Specimens from this location are very hard to come by these days, as the mine is now defunct. 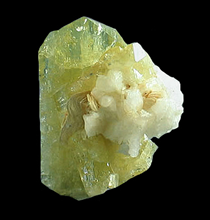 A specimen of opaque, off-white-colored Spodumene from Newry, Maine. 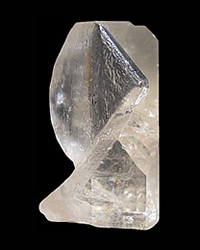 The Spodumene is terminated on one end and sits in/on a matrix of Quartz. 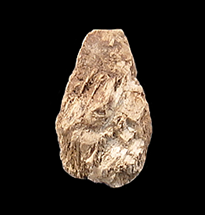 Also present on the specimen are several areas of silvery-colored Muscovite. 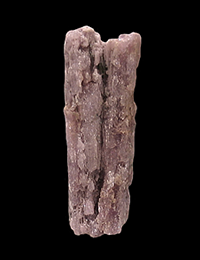 A doubly terminated, gemmy and lustrous, purple-pink Kunzite crystal from the much less well-known San Pedro Mine on Hiriart Mountain, San Diego County, California. Over the years the mines of the Pala district have produced a significant amount of Kunzite, much of it being of high quality. I think that Kunzite specimens from San Diego are far better than what you can get from Afghanistan and are rivaled only by the Kunzite from Brazil. Specimens from Pala such as this one are not easy to find these days as Hiriart Mountain was reverted back to the Pala Tribe in 1992. A prismatic Quartz Quartz crystal sporting a jacket of millimeter-sized crystals of Apatite and Quartz. This singular specimen started as a Smoky Quartz which was covered by a 2 mm layer of clear Quartz and then covered by richly-colored Apatite crystals and some small quartz crystals as well. 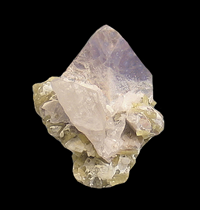 There is also a second Quartz hitchhiking on one side of the specimen that is partially contacted. 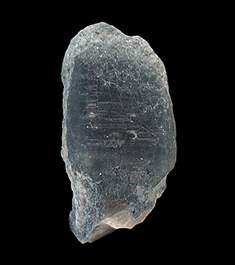 A different kind of Apatite specimen from the Pech Valley of Afghanistan. One thing you don't see often from Pingwu are specimens of Feldspar. This specimen consists of three baveno-twinned crystals of Microcline on a matrix of Muscovite accented by small crystals of clear Beryl. The Microcline crystals have a good lustre and are completely intact. 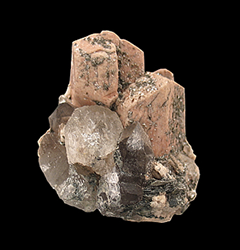 This specimen features many spheres of Muscovite measuring up to 7 mm in size, on a matrix of flesh-colored Orthoclase. 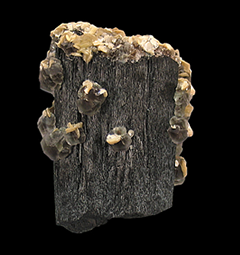 Examples of botryoidal Muscovite, or any of the Mica minerals, are rare. 5.7 x 5 x 1.5 cm. A well-formed, complete all-around. 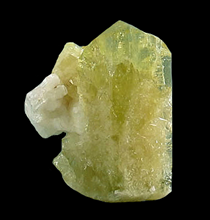 gemmy and faintly pastel-green-colored Spodumene from a classic San Diego County location. 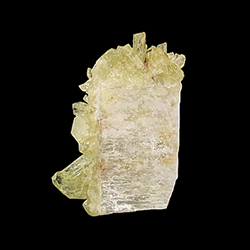 This is a curious and singular specimen in that it has a color that is not usually seen in Spodumene from Southern California. A very good example of San Diego Spodumene. 5.2 x 3.4 x 1.2 cm. Here we have a translucent crystal of Microcline draped with many very gemmy crystals of Brazilianite. There have been a lot of Brazilianite specimens available the last 10-12 years but you don't see that many on matrix. Especially ones that look as good as this one. 7.4 x 5.1 x 1.4 cm. 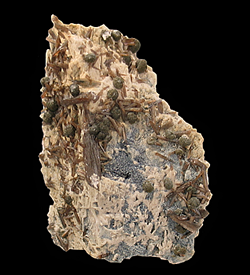 This specimen features a pair of phosphate minerals; balls of greenish Zanazziite and bladed brown-colored Eosphorite on a matrix of Microcline. 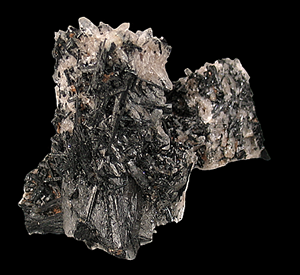 Also present on this specimen are numerous, matted masses of an unidentified grayish mineral in prismatic crystals with a sub-metallic lustre. 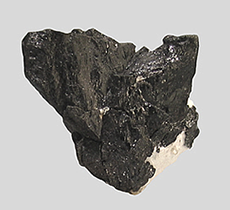 Taquaral is noted for the variety of rare phosphate minerals that can be found there. 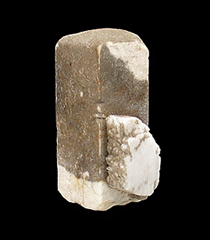 A well-formed, columnar, Baveno-twinned Feldspar crystal with a modified termination. 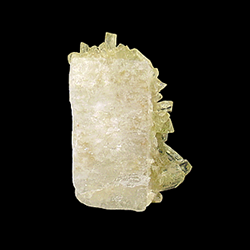 This crystal features a jacket of finely crystallized Muscovite and is accented by a second, smaller crystal hitchhiking on its side. 7.7 x 1.8 x .7 cm. This doubly-terminated Kunzite is an example of a modern day classic from San Diego County. 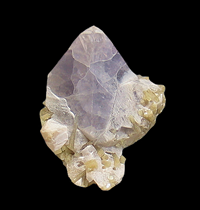 Near the end of it's existence as a working mine, the Oceanview produced a good amount of strikingly deeply-colored Kunzites. 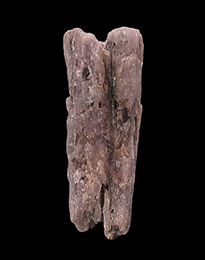 This specimen has a rich purple hue and good form and is mostly clear. No more work is being done at this mine. The Oceanview property now serves as an equipment storage and staging area for underground mining operations at the Oceanview adit on the Elizabeth R. lode mining claim, as well as the location for commercial fee-for-dig mineral dump screening operations. 4 x 3.9 x 2.6 cm. This magnificent, as far as pseudomorphs are concerned, mineral specimen was found around 15 years ago by friends of mine from southern California while on vacation in Colorado. Being a collector of pseudomorphs myself, I am greatly impressed by the faithful replacement of the Siderite by the Hematite. 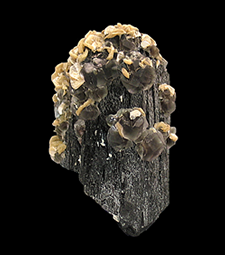 Most pseudomorphs do not retain such an exact form of the mineral species that they have replaced. The Hematite pseudomorphs are perched on a crystal of Microcline making for a nice contrast of colors. 2.6 x .7 x .6 cm. Besides the usual pegmatite minerals, the Little Three Mine has a strange and unusual list of not so common pegmatite minerals that occur there. 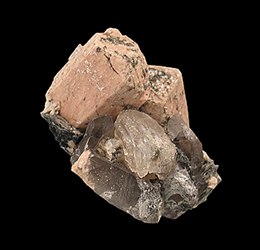 Hambergite in general is rare and Hambergite from The little Three is very, very rare. I have only seen maybe less than a dozen examples in all of the years that I've been collecting minerals. 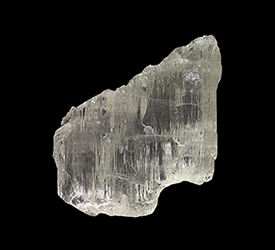 Hambergite is an anhydrous borate that contains Hydroxyl or Halogen. This columnar crystal is a little larger than average for this locality. I considered cleaning the specimen but, being from this location with an unusual mineralogy, was afraid that what I would remove could be some other rare mineral. 2.2 x 1.3 x 1.2 cm. Besides the usual pegmatite minerals, the Little Three Mine has a strange and unusual list of not so common pegmatite minerals that occur there. 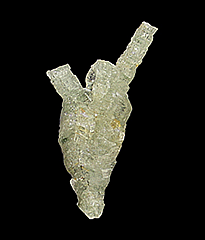 Hambergite in general is rare and Hambergite from The little Three is very, very rare. I have only seen maybe less than a dozen examples in all the years that I've been collecting minerals. This stout prism of Hambergite is nearly a floater and has no issues other than a very tiny portion of the termination where it is contacted? I considered cleaning the specimen but, being from this location with an unusual mineralogy, was afraid that what I would remove could be some other rare mineral. 4.6 x 1.4 x 1.1 cm. Apatite from this mine has come out in a huge array of styles over the years, this particular form being the most interesting in my opinion. 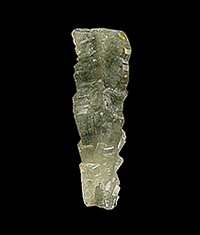 This sculptural and complex Apatite crystal shows an interesting inter-grown form. As an added bonus the crystal is hollow and double-terminated. This crystal is damage free and has a terrific lustre. 5.6 x 3 x 1.3 cm. Apatite from this mine has come out in a huge array of styles over the years, this particular form being the most interesting in my opinion. 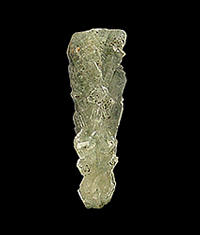 This sculptural and complex Apatite crystal shows an interesting inter-grown form with divergent columns emanating from the upper portion of the specimen. As an added bonus the crystal is hollow terminated on all ends and damage free with a great lustre. 5.8 x 5.6 x 4 cm. 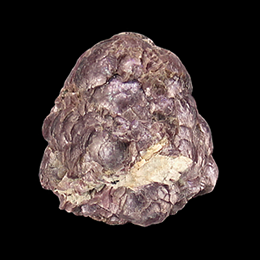 Once abundant, examples of "ball" Lepidolite are not often seen these days. 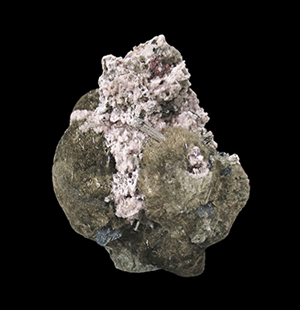 This colorful Lepidolite specimen features a myriad of shell-like layers that exhibit a metallic sheen. 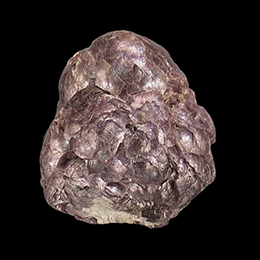 This mound of "ball" Lepidolite is from a find made in the 1970's. 5.5 x 5.3 x 3.4 cm. This specimen consists of two well-formed, twinned crystals of Microcline partially surrounding a slightly etched crystal of Topaz. Also present are several crystals of Smoky Quartz. The whole assemblage is dusted with minute crystals of Muscovite and a little bit of Chlorite. 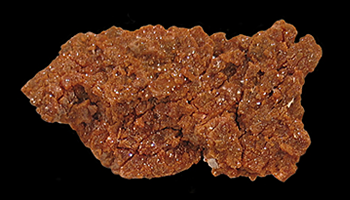 This specimen is nearly a floater, with only a portion of the bottom of the specimen showing any contact. 5.5 x 6.5 x 3.5 cm. A fine lustrous and transparent Topaz crystal from one of Brazil's "other Topaz localities". This strangely-shaped Topaz crystal is smooth as glass on one side and lightly etched on the other. Fortunately, this crystal was saved from irradiation that would have otherwise turned it blue making it desirable as faceting rough. A curious specimen from the country whose mineral wealth seems to be never-ending. 8.5 x 6.6 x 4.1 cm. Being someone who has an appreciation for any mineral specimen that is out of the ordinary, I fell in love with these when I first saw them. A majority of the combinations mineral species that can be found in Erongo are quite abundant, it seems to me that Pseudomorphs are under represented at this famous location. I acquired this specimen in 2006 when they first trickled into the market. They never were very abundant though and still aren't. 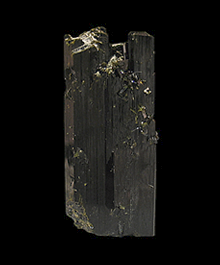 This specimen is a complete and total replacement of several crystals by Orthoclase and transparent crystals of Quartz ranging in size from sub-millimeter to several that are 2+ centimeters, on top of which are many crystals of the variety of Tourmale, Schorl. This specimen lived in my collection until recently when I decided that I didn't need as many as I had accumulated. The bottom of this specimen features a surprise that you'll have to see in person. The surprise is nothing monumental but it is a nice little touch to a very aesthetic specimen. 6.7 x 6.9 x 5.8 cm. Being someone who has an appreciation for any mineral specimen that is out of the ordinary, I fell in love with these when I first saw them. A majority of the combinations mineral species that can be found in Erongo are quite abundant, it seems to me that Pseudomorphs are under represented at this famous location. These never were very abundant and probably won't be in the future. 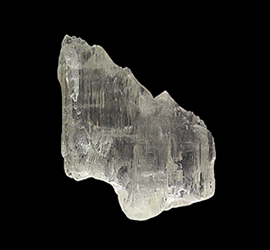 This specimen is a complete and total replacement of five Orthoclase crystals by tiny Quartz crystals with a green cast and some crystals of Smoky Quartz, one much, much bigger than the others. This specimen lived in my collection until recently when I decided that I didn't need as many as I had accumulated. 3 x 2.4 x 2.2 cm. 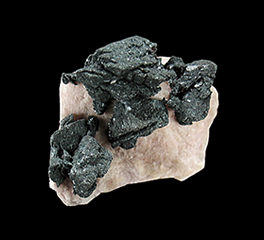 One mineral that you don't often see from Brazil's pegmatites is Siderite. It just isn't that common. 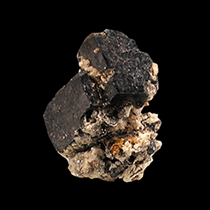 This specimen features a complete all-around, damage free 2.5 cm. 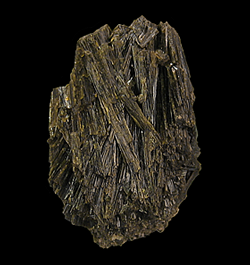 crystal of Siderite with crazy form. Normally I would have cleaned this specimen, but was reluctant to do so just in case the ochre colored mineral on the Siderite was something special. 6 x 2.2 x 1.5 cm. A very lustrous specimen of Lepidolite replacing Tourmaline. Traces of green-colored Tourmaline can be seen on closer examination. This specimens is an “old timer” that was found in the 1970's. 6.8 x 3 x 1.3 cm. 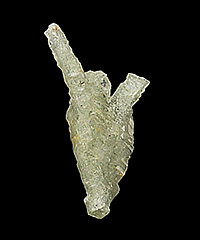 Here we present a slender prismatic crystal of Epidote with a crenellated termination. This is an excellent example of Brazilian Epidote that shimmers in the light and the little pistachio-colored crystals on the front are a nice accent. 6.4 x 4.5 x 3.4 cm. This Schorl specimen is adorned with cuboctahedral crystals of Fluorite that show well-oriented purple and Green zoning. 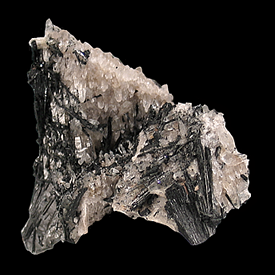 In addition to the Fluorite, the Schorl is crowned by rosettes of Muscovite that cascade down the back of the specimen. 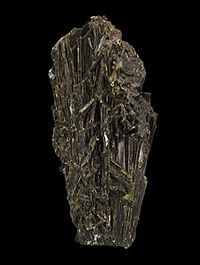 And to bring it all together, the Schorl has a satin-like lustre that is very pleasing to the eye. This is a much better than average example of this material that lived in my collection for almost 10 years. 3 x 2.7 x 1 cm. 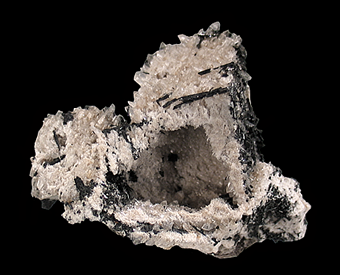 A well-formed (for San Diego County) example of Cassiterite on Albite. 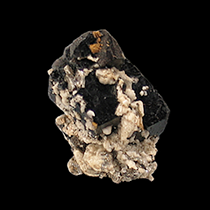 The Cassiterite is twinned and is complete, sitting on a matrix of Albite. 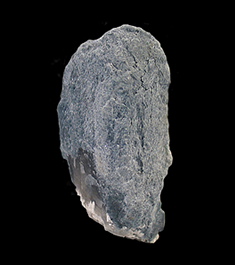 Cassiterite is quite uncommon as far as the pegmatites in San Diego County are concerned. Well-formed examples from San Diego County are very rarely encountered. A must-have for any serious collector of pegmatite minerals. Well formed, crystals of pink Albite. 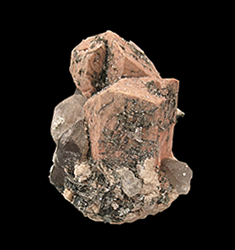 Pink-colored Albite crystals are not very common overall but seem to be more common at Mont Saint-Hilaire. This specimens is also intensely fluorescent. 7.4 x 3.3 x 3.2 cm. A rare and significant specimen from this less well-known Mexican skarn deposit, south of the resort town of Ensenada in Baja, California. 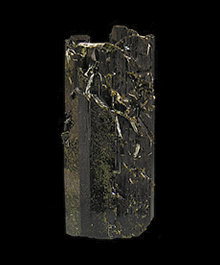 A dramatic spray of deep-green Epidote crystals with a superior lustre. The terminations of the crystals are complete. A great addition to one's mineral collection. 5.5 x 4 x 2.3 cm. 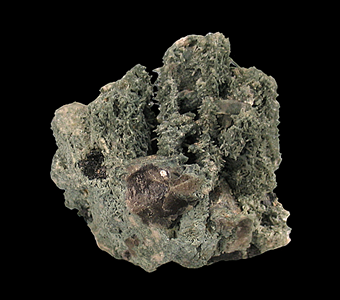 A singular Epidote specimen from the Ensenada region of Baja, California. The label accompanying the specimen gave it a location of Ojos Negros, a small town in the Baja wine country east of Ensenada. 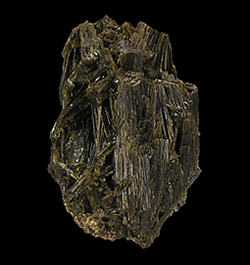 This specimen consists of a bundle of lustrous, deep-green Epidote crystals with a good lustre. The terminations of the crystals are complete. A great addition to one's mineral collection. 3.3 x 2.5 x 1.7 cm. 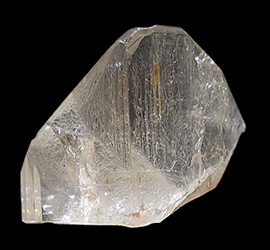 A very lustrous and partially transparent crystal from the find made in the late 1990's. Examples of this material are not so easy to find these days. 5.2 x 3 x 1.3 cm. 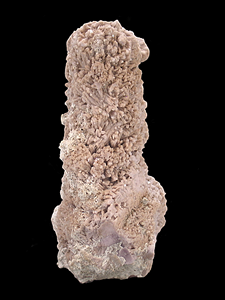 This specimen features a myriad of crystals of the rare oxide Microlite encrusting a matrix of Albite. 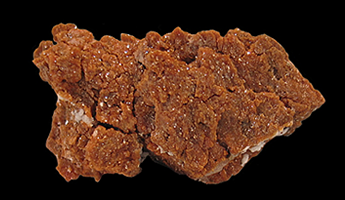 This specimen of sparkling, orangish Microlite crystals is considered to be rich for the species. 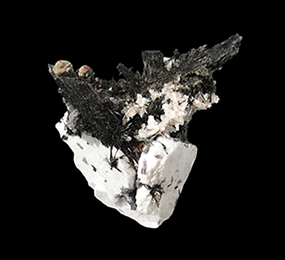 The Ipê pegmatite is well known for its production of Microlite group minerals and others containing Niobium, Tantalum, and Beryllium. 7.4 x 3.3 x 3 cm. When I examine this specimen I have a hard time figuring out where the Quartz ends and the Tourmaline begins. Is this a Tourmaline specimen or a Quartz specimen? I've handled my share of these Indicolite included Quartz crystals over the years but have not seen one quite like this before. 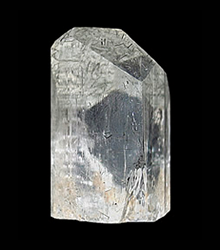 This singular specimen is heavily included to the point that it is draped with a cascade of minute Indicolite crystals. You will either find this piece ugly or you will embrace its weirdness, like I did when I bought it. 6 x 6 x 3 cm. 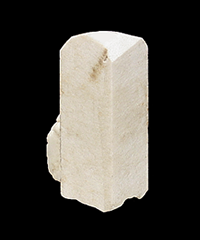 This three-dimensional specimen features a pair of Albite crystals crowned with sprays of needle-like Aegerine crystals in which numerous translucent, white flower-like clusters of the rare mineral Eudidymite burst forth. 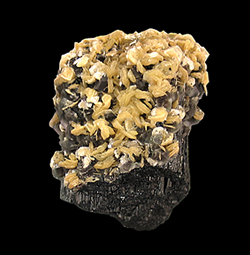 It is not common to find specimens that are so richly covered with Eudidymite as this one is. 9.6 x 4.4 x 3.8 cm. Barra do Salinas has a long-lived reputation for producing stunning specimens of Elbaite and of Kyanite. I believe if there were more of these dramatic Lepidolite crystals rplacing Elbaite crystals available they too would be considered classics by those who appreciate a good pseudomorph, epimorph or other mineral oddity. 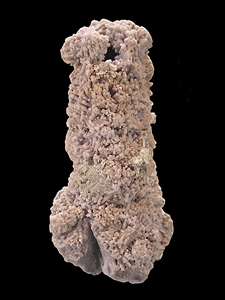 This specimen features numerous well-formed, Lilac-colored, Lepidolite crystals replacing Elbaite which have dissolved to leave tubular hollow casts. 10.1 x 8.2 x 5.3 cm. 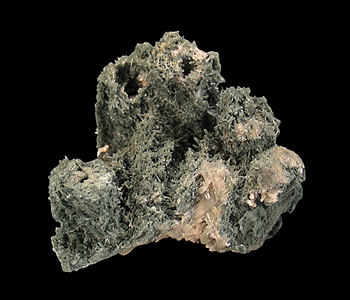 This decidedly different specimen is carpeted with sparkling, light-green tufts of the mineral Aegerine atop a base of Albite. 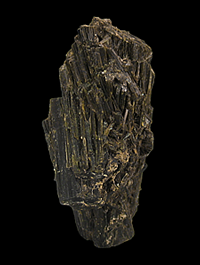 Protruding from the needle-like Aegerine are green-gray crystals of the mineral Elpidite measuring up to 1.9 centimeters in size. Accenting this specimen near the top is a 1 x 1 centimeter cluster of deep red Rhodochrosite crystals. 4 x 2.5 x 2.3 cm. When one thinks of Erongo, the first thing that comes to mind are the plethora of Aquamarines and world class Fluorite specimens that this modern-day classic mineral location has produced. Erongo Mountain, over the years has produced some great Topaz as well. This Topaz shows just a slight blush of blue when viewed down the c-axis of the crystal, especially from the bottom. The terminal faces of this Topaz crystal are covered with dozens of needle-like Schorl crystals. 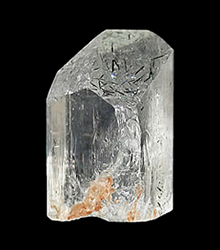 While there are several corners on the bottom of the crystal that have some dings, the largest one appears to have happened in situ as its surface exhibits several small growth hillocks suggestive of regrowth. 3.2 x 2.6 x 1.5 cm. To my knowledge I believe that these crystals are the first purple Hydroxylherderite specimens to come from Brazil in many years. Previously, all I have seen were the crystals found in the mid 1970's that appear from time to time as they are recycled from one collection to another. I purchased these from a dealer who bought the whole find, which amounted to less than 3 dozen crystals. I think these crystals would make a fine addition to any pegmatite collector's mineral cabinet.